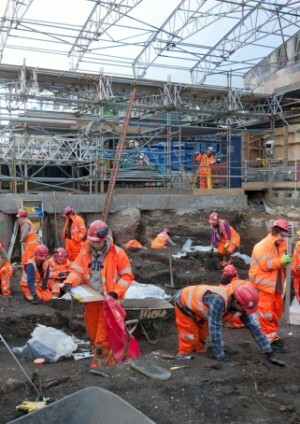 Crossrail passes through the heart of the West End of London and along the north edge of the Roman and Medieval city where deep construction for several new stations has required the careful assessment and evaluation of the archaeological sequence at some key historic locations. Important historic buildings and industrial archaeology sites are also being investigated. This paper provides a description of the organisational framework that the archaeology programme operates in and looks at the project design, management structure, access and programme risk constraints that have affected the project planning. It will look specifically at how the various stakeholders have agreed to control impacts on archaeological sites, the coordination of the multiple consultants teams and contractors who are undertaking archaeological works for the project. Results so far (2010) and some of the key challenges are also discussed. This paper was published in ‘the Proceedings of the Conference of Cultural Heritage and New Technologies (CHNT) 15’, Vienna 2010 (p518-537) and can be accessed here.